I came across this Owl whilst walking in a forest area at the north western edge of London, in south western Ontario. I followed it around for a while as it flew from perch to perch above a creek and was amazed at how it hung upside-down from tree branches. I had never seen an Owl do that before. 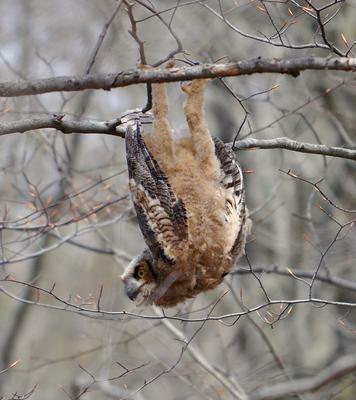 Thanks for sending this report to us, and for the cute picture of the Owl hanging upside down! I have never observed that behaviour either! Owls, like bats, will hang upside down for flight. Bats haven't the strength to flap their wings to take flight, they need to drop flipping over, filling their wings with air. Owls do have the ability to take flight from the upright position, but they make a lot of wind noise with the movement of their giant wings. This noise gives their pray a warning of the owl's presence and possibly giving the pray a chance to get away. If the owl hangs upside down it can target the pray, then drop, filling the wings, swooping up on its pry with little to no noise or warning. Beautiful photo and great capture. I've never seen an Owl upside down either.